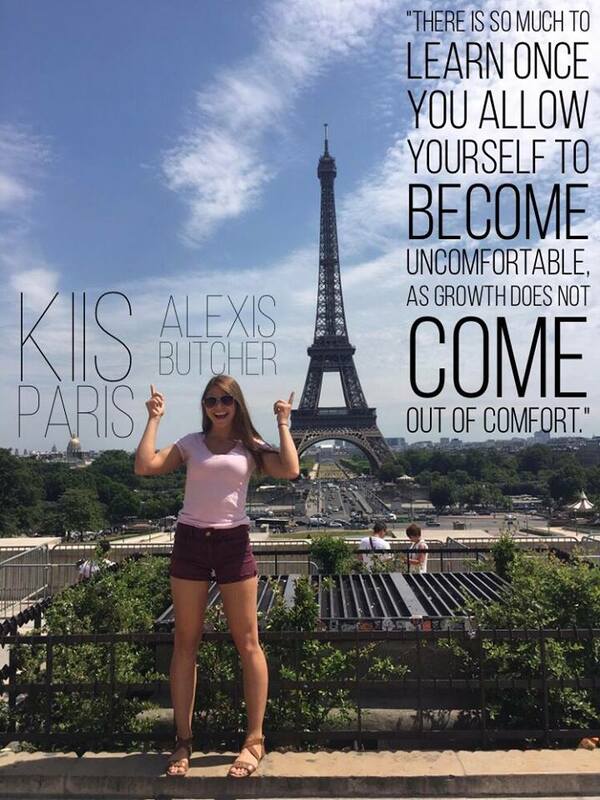 My education program with KIIS study abroad was a dream come true. The program was engaging, insightful, interesting, surprising, and invigorating. The people within the program were very welcoming and cared about each student's safety. It felt amazing right away and it only got better from the start of the orientation meeting. 2. Is this a good program for other students in your major? This is a great program for those in the psychology field! The classes go out into the city to observe the life and art in France. I enrolled in 'Art of Psychology and Nonverbal Behavior', where we compared the differences between our home state in various ways, including culture, behavior, language, etc. It was very eye-opening to my own behaviors and promoted me to think deeply about my classwork. 3. Was this your first time abroad? This was my first time abroad but it will not be my last! 4. 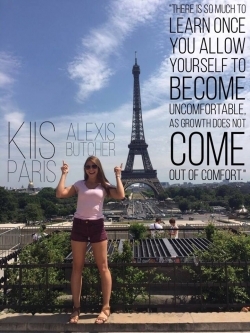 How do you feel that you benefitted from studying abroad? I benefited from studying abroad in a multitude of ways. This opportunity allowed me to understand people a lot better and helped me open my mind even more. I learned how people communicate in various ways to say the same thing, verbally and non verbally. I learned from many facets including the city of Paris, museums, my peers, my teachers, and travelling on my own while not in class. I benefited in managing my time and organizing my money wisely. I could see America from an outside perspective and converse with others whose views were very different. A lot of places and things I got to see were created way before America was founded, which was astonishing to visualize such amazing history. There is so much to be learned once you allow yourself to become uncomfortable, as growth does not come out of comfort. 5. How do you think this experience will impact your future plans? This experience impacted my future in such a positive way. I am now comfortable with travelling abroad and plan to travel overseas again to seek out knowledge and adventure. Studying abroad in a foreign country expanded my horizon of opportunity and made me a more well-rounded person overall. 6. How did the experience differ from your expectations? About every little thing was not what I expected at all for it to be! Before arriving in Paris, I did not know how environmentally friendly they were and it became so amazing to be a part of it for the short month that I stayed. I also learned the French do not make a lot of eye contact when walking, which was quite odd as here in America we say “Hello!” to numerous people we pass by. I will also mention that when ordering a regular coffee, it comes as an espresso shot and when eating at a restaurant, it is absurd to split checks. 7. What other countries have you traveled to? While studying abroad, some of my friends and I went to Switzerland for the weekend. This was very interesting as it is very different from Paris. We had to change our Euros to Francs and we found out quickly that it is a very expensive place. The chocolate was impeccable though, the views were magnificent, the people spoke around four different languages, they have a militia army, and they are a part of NATO- partnership for peace. Quite a dreamy place, if I do say so myself. 8. Favorite thing about studying abroad? My favorite thing about my study abroad experience starts with it being too amazing to boil down to one thing. I will begin by mentioning the people that I got to experience it with - they brightened my days and we all had each other’s back through it all. It made my heart happy to see all the art and creativity spilling from every crevice of Paris, along with the amazing new experiences I was grateful to acquire, such as new foods, transportation, music, etc. These are just a few of my favorite things from living and learning abroad. 9. Suggestions for future students? Always prepare and pack for anything! You never know what adventure or weather tomorrow might hold. Don’t fear new things because you never know until you try. Plus, it’s okay if you don’t know anyone at first because you will make friends, no doubt. Life is a beautiful adventure if you allow it to be. Follow your dreams, always.